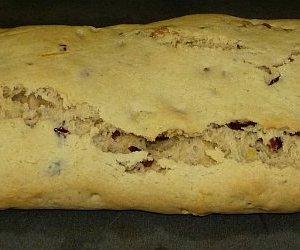 Biscotti are generally considered Italian, but the same type of cookies of Russian origin are called "sukhariki". The following recipe was given to me by a lady who had immigrated from Russia in her youth. With a fork, beat the eggs, sugar, oil, vanilla and salt until homogeneous. 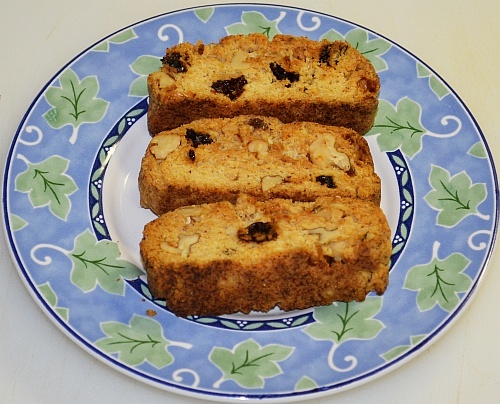 Add the walnuts, raisins, and lemon peel and mix until the raisins and walnuts are uniformly coated. In a separate bowl, mix the flour and baking powder and add to the egg mixture. Mix with a spoon or knead with the hook of a stand-up mixer. The dough may be sticky. Oil your hands and shape the dough into two loaves 1/2 inch (13 mm) thick. Bake at 375°F for 20 minutes on a greased sheet. While warm, slice into half-inch strips with a sharp knife. Return the slices to the oven at 350°F for 15 min., turn over and bake another 15 minutes until crisp. NOTE: It is important for the loaves to be about 1/2 inch thick. If the loaves are thicker, the outer crust will dry out while the center continues to expand, and the outer layer will crack, as illustrated below. 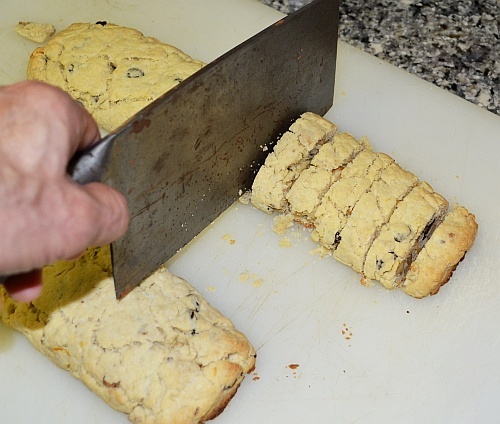 This makes it more difficult to slice the biscotti because they will tend to crumble. The crust will crack when the loaf is too thick.